In its first two colorways, the Nike KD 8 has proven its range of versatility from the all red “V-8” to the highly graphic “USA” print. Once again, the KD 8 will debut yet another loud zebra-esque upper on Nike’s new Flyweave technology. 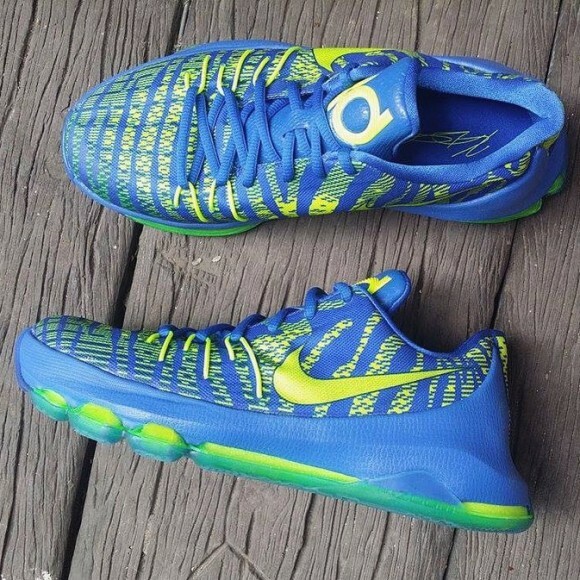 This time Kevin Durant’s signature sneaker will feature a Sprite-inspired colorway called the “Hyper Cobalt”. Let us know what you think of the Nike KD 8 thus far in the comment section below. Look for this colorway to drop on Saturday, August 8 at Nike.com and other basketball retailers. I’m pretty sure most people agree that this is one of the ugliest shoes ever made. You could ask 1 million first graders to design a shoe and 999,999 would be better. The 1 that’s worse would be from a blind child.